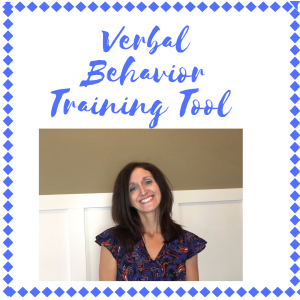 Welcome to my training tips and tools for introducing the verbal operants. In this blog post you will find a description of the operants mand, tact, echoic, intraverbal. At the bottom of the post, you will find a video that you can use with staff to “test” their understanding of these operants in a super fun way!! Learning about the verbal operants is very important when working with students with more complex communication needs. B.F. Skinner wrote the book Verbal Behavior (1957), which looks at the functional analysis of language. He talks about language in terms of how it functions – verbal behavior – which is where verbal operants come into play. In the below charts A = antecedent, B= behavior and C = consequence. Manding. A mand is a request.We start work on this operant to help increase a learner’s spontaneous communication, encouraging them to ask for things that they want. Tacting. Involves labeling a picture, object or action. Students may work on tacting to increase their expressive vocabulary. Intraverbal. Filling in the blank and answering questions are both examples of intraverbals. Intraverbals are the basis for reciprocal conversation. They are the building blocks for engaging verbally with others. Echoic. repeating what is heard, usually immediately. Work on echoics can help a learner say many different functional words. Echoics can also be worked on to systematically address saying different sounds and syllable shapes. Listener Behavior. Following instructions or complying with a request: walking to the nurse’s office when given the direction “Please take this to the nurse’s office,” for example. We work on this skill set to increase overall receptive language skills. Don’t forget to download your free training video below!